If you’re in charge of a team who’s working on a project…delegate. Using the Assign Tasks feature in Outlook is a great way to assign jobs to others on your team. If you’re in charge of a team who’s working on a project…delegate. 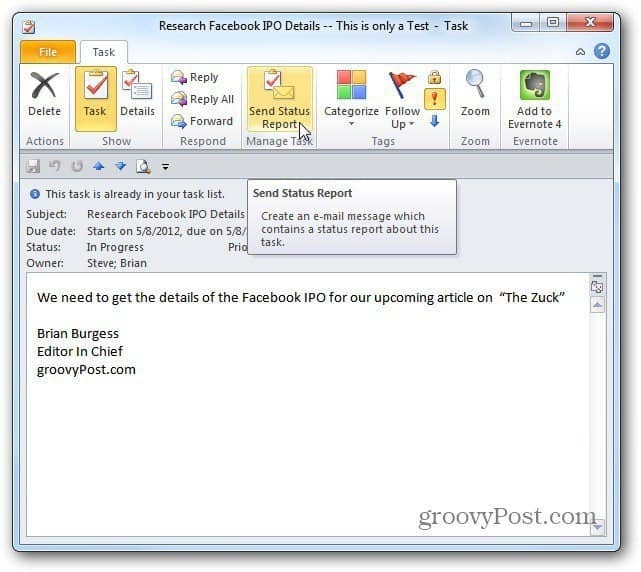 Using the Assign Tasks feature in Outlook is a great way to assign jobs to others on your team. 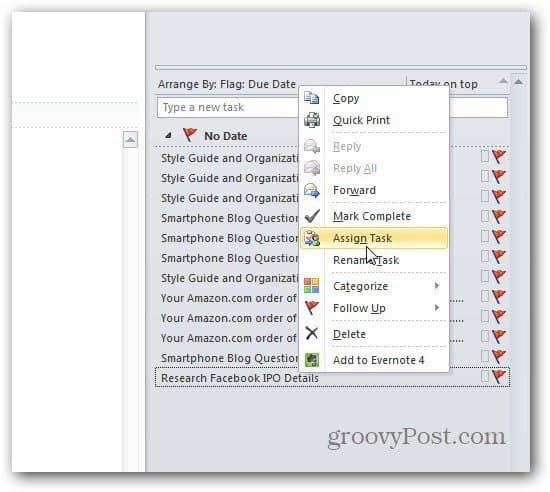 Here’s how to use the Assign Tasks feature in Outlook 2010. Note: This feature is available in previous versions of Outlook too. To assign a task, expand the To Do pane in Outlook. 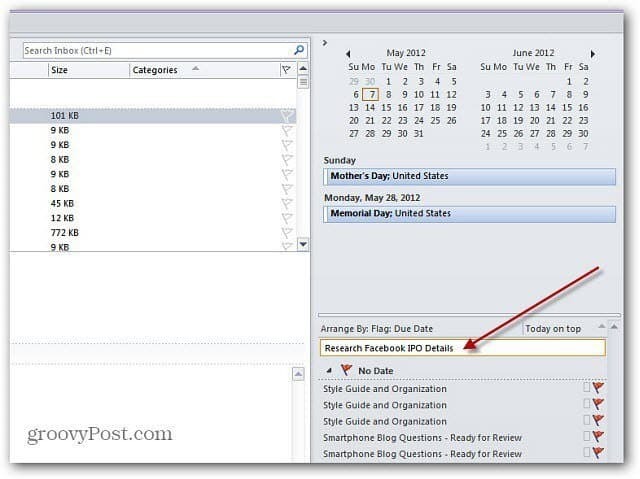 Then below the calendars, type in a task and press Enter. 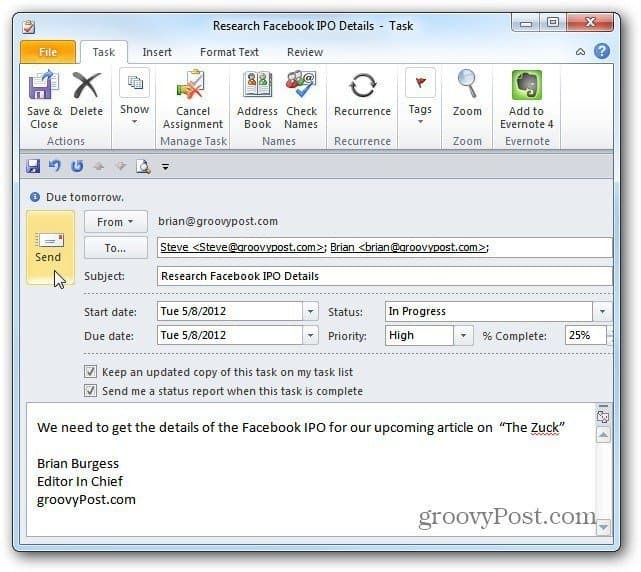 In this example I am having a member of my team research the Facebook IPO in detail. Next, right click on the task and select Assign Task from the Context Menu. The Task screen comes up. Now, enter the email address of the contact(s) of the people on your team to assign the task to. Enter the Start and Du date, Status, Priority and percentage that’s complete. Then send it off to the recipients. Now the other people on your team can add the task to their list, send status reports and manage the task in Outlook to work best for them. You can use this feature over the web or on a local network in a business. It’s yet another tool that allows people to stay in touch and collaborate on important projects. Hi Brian – nice simple post, makes it easy to understand how to do this – question – have you tried to assign a task to a team member who strictly works off an iphone the tasks dont seem to even get to the mobile worker? I’m also trying to work out a way my mobile service techs can retrieve tasks I assign them. They are using iPhone 4 with iOS6. Also tried android phones. Exchange doesn’t pick up the emails and neither does reminders… Does anyone know an app that will work with task assignments? hey, i have got a problem with assign tasks in 2010, i can assign but when the other user click the complete task, what i still sees is its not completed.. please help.